Extension agents and specialists are recognized for their work. 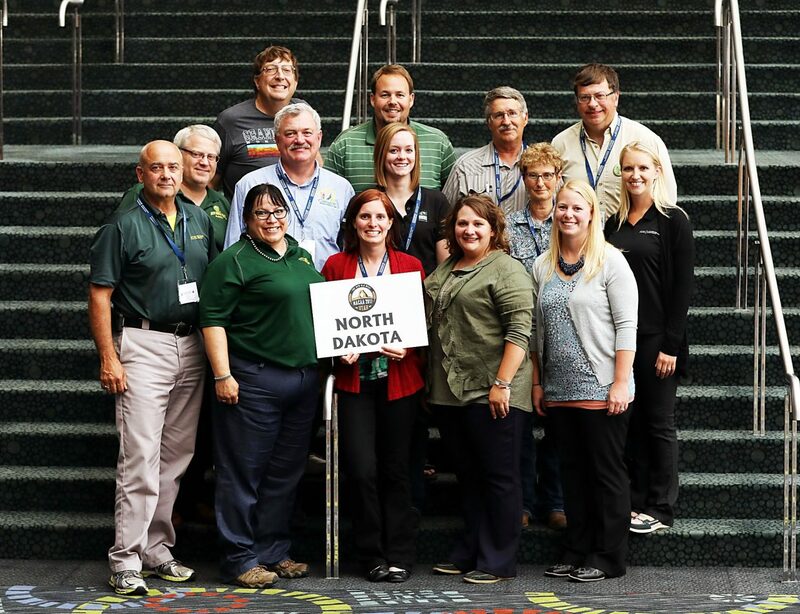 Several North Dakota State University Extension Service agents and specialists were honored for their work during the recent annual meeting and professional development conference of the National Association of County Agricultural Agents (NACAA) in Salt Lake City, Utah. Dan Folske, agriculture and natural resources agent in Burke County – National Distinguished Service Award, which recognizes the recipient with a 10-plus-year Extension career for long-term effectiveness of Extension programming. Folske has been an Extension educator for more than 27 years and is known for his programming in horticulture, cropping systems and computer technology. He works with youth at area schools and in 4-H clubs to start plants indoors, making sure each participant receives transplants to take to a home or container garden. He is known as the "go to" person for computer problems in Burke County and has led the way in the use of technology in Extension programming and on the farm. Mary Berg, area Extension livestock environmental management specialist at the Carrington Research Extension Center – National Achievement Award, which recognizes outstanding educational efforts by a person with less than 10 years of experience with the Extension Service. Berg's Extension programming focuses on water quality improvement via livestock manure management. She is secretary of the North Dakota Association of Agricultural Extension Agents and treasurer for the North American Manure Expo. Berg also was the state winner in the Website, Video Presentation and Fact Sheet categories. These awards recognize her efforts with her website, Center Points, a weekly blog that highlights current research and programming at the Carrington Research Extension Center, and her YouTube clip "How to Compost Dead Livestock" and a companion-piece printed guideline titled "5 Easy Steps for Composting Dead Livestock." Alicia Harstad, the agriculture and natural resources agent in Stutsman County, collaborated on these projects. In addition, Berg was named a state winner and national finalist in the Search for Excellence in the Consumer or Commercial Horticulture category for her learning module "Kids, Compost, Crops and Consumption," which was developed with team members Todd Weinmann, the agriculture and natural resources-horticulture agent in Cass County, and Harstad. Weinmann – honored in the Program Promotional Piece category for his leadership and collaboration with Fargo Cass Public Health in designing and planting a successful containerized community vegetable garden. Greg Endres, area Extension cropping systems specialist at the Carrington Research Extension Center – regional winner in the Publication category. His Extension publication, "Impact of Planting Dates on Dry Edible Bean," emphasizes that the traditional planting dates from late May to early June remain appropriate because early planting increases risk, while seed test weight increases at normal planting dates. This publication won at a state competition before advancing to the regionals. Hans Kandel, NDSU Extension agronomist, co-authored this publication. Harstad – state winner in the Computer Generated Graphic Presentation category for a presentation that's part of the NDSU Extension's "Composting Dead Livestock" program. It details the process of effectively dealing with mortalities while creating beneficial compost suitable for application on cropland. Mary Berg collaborated on this project. Lindy Berg, agriculture and natural resources agent in Towner County – national finalist for Poster Presentation in the Extension education category. Her poster highlighted a real-life case study of a local producer who was faced with frost-damaged flax and wondered whether he should replant flax, start over with soybeans or see how the original crop recovered. Berg competed at state and regional levels before advancing to the national level. 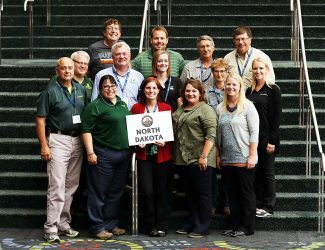 Lindy Berg also was the North Dakota honoree in the Search for Excellence in Crop Production category for "Women on the Farm," a collaborative project with the Towner County Soil Conservation District and Dakota Precision Ag Center at Lake Region State College. The project educates women, empowers them to expand their role on the farm, and helps them gain a better understanding of the everyday problems and solutions in agribusiness. In addition, Lindy Berg was recognized as a state winner for her weekly column, "People Were Wondering," published in the Towner County Record Herald and distributed via email from May through October. Each week's installment is distributed to 2,700 households in Towner County. The column addresses horticulture and farming questions from the community. Craig Askim, agriculture and natural resources agent in Mercer County – Agriculture Awareness and Appreciation Award for his recent master's thesis on the importance of agriculture education and agricultural literacy across North Dakota and in his county. Brad Brummond, agriculture and natural resources agent in Walsh County – named to the State and Regional Halls of Fame for his lifelong service to Extension. Brummond has been heavily involved with underserved audiences throughout his career and is best known for his work with organic and sustainable agriculture programming in North Dakota. Mary Berg, Weinmann and Harstad were recognized for their team newsletter, "KCCC-Kids, Compost, Crops and Consumption," which advanced through state and regional competitions before competing on this national platform. Mary Berg also presented a seminar at the conference on the long-term value in developing meaningful relationships with constituents. More than 1,000 Extension professionals from the U.S. and Puerto Rico attended the conference.